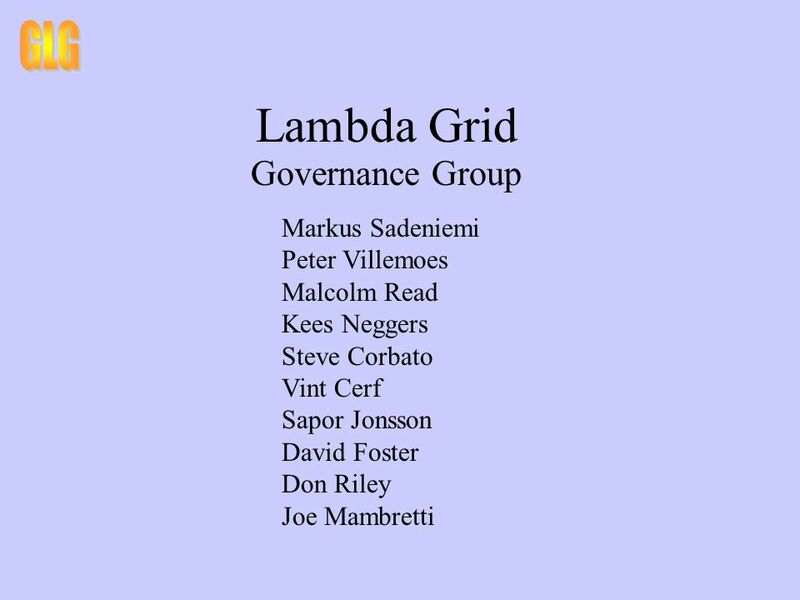 Lambda Grid Governance Group Markus Sadeniemi Peter Villemoes Malcolm Read Kees Neggers Steve Corbato Vint Cerf Sapor Jonsson David Foster Don Riley Joe. 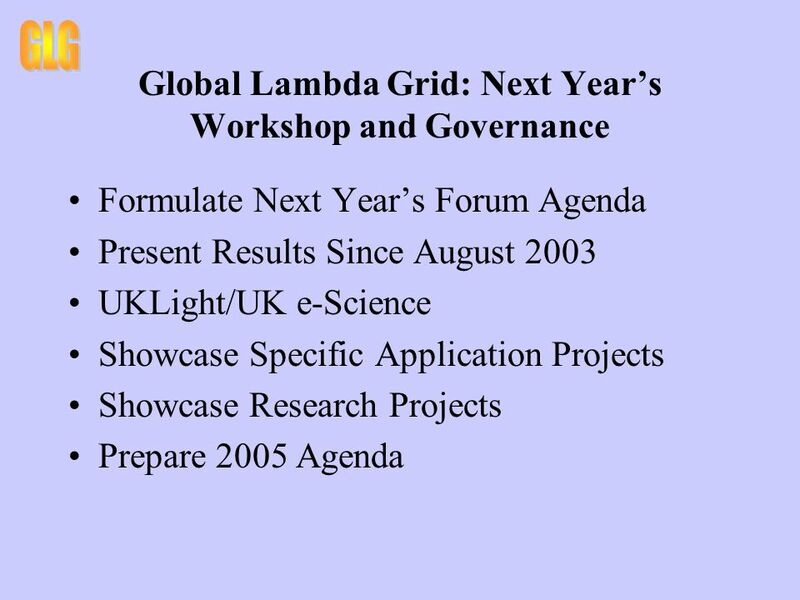 4 Global Lambda Grid: Governance and Corporate Partnerships Objectives: Define Corporate Relations Model Application Drivers Relationship Structure Technology Transfer Commercialization Basic Economics and Service Providers Role of Service Providers Partnerships with Service Providers Partnership Models Equipment Corporations? Download ppt "Lambda Grid Governance Group Markus Sadeniemi Peter Villemoes Malcolm Read Kees Neggers Steve Corbato Vint Cerf Sapor Jonsson David Foster Don Riley Joe." The PRS context. PRS snapshot Introduced in late 1999 Intended a fundamental shift in relationship 50 countries –About half in sub-Saharan Africa –About. BUFDG Conference 2003 The Pricing Agenda Professor David Westbury Chair, Joint Costing and Pricing Steering Group. From AgentLink II to AgentLink III Co-ordinators: Peter McBurney, University of Liverpool, UK Terry Payne, University of Southampton, UK. World Bank STI Capacity Building Programs: IP As A Crosscutting Issue Alfred Watkins S&T Program Coordinator Geneva November 6, 2009. Capacity Assessment and Monitoring in CD Support Projects in Solid Waste Management Sector Mitsuo YOSHIDA, Ph.D. Senior Advisor Institute for International. GGF Telco-CG and TMF. Newly formed Telco-CG within the Global Grid Forum Chairs: –Frank Falcon, British Telecom –Pramila Mullan, France Telecom –Franco. HEMISPHERIC PROJECT TEACHER EDUCATION TRINIDAD AND TOBAGO SENATOR HAZEL MANNING. AKIS – ARCH Cooperation Joint Workshop Best strategies for intercontinental research and innovation partnerships – towards greater impact on global challenges. Global Lambda Integrated Facility (GLIF) Kees Neggers SURFnet Internet2 Fall meeting Austin, TX, 27 September 2004. Partnerships for Prosperity (P4P) An overview PPD Workshop, March 2014. NREL is a national laboratory of the U.S. Department of Energy, Office of Energy Efficiency and Renewable Energy, operated by the Alliance for Sustainable. 1 Foreign Direct Investment and IP in Knowledge-based Development Ralph Heinrich UNECE Team of Specialists on Intellectual Property Minsk, 9-10 June 2010. 1 Fabrizio Sestini New Paradigms and Experimental Facilities DG Information Society and Media "The views expressed in this presentation are those of the.